Renovation has become somewhat of a trend in home design, but it is certainly a trend we can get on board with, sine it promotes beauty and sustainability. 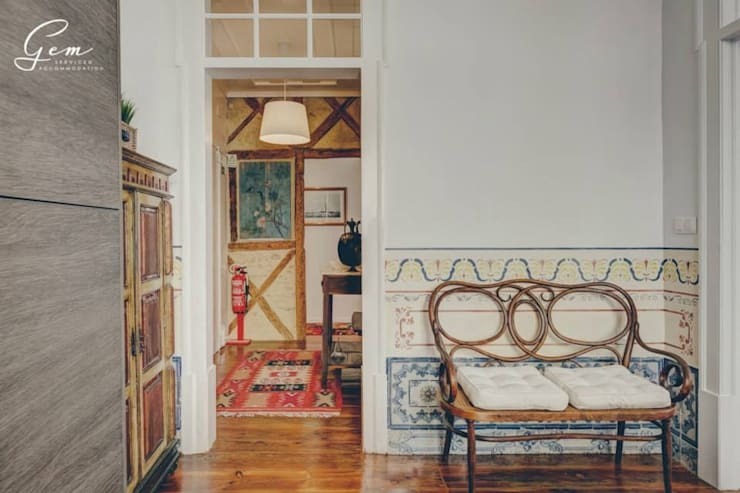 Some cities seem more suited than others to deliver the right inspiration for really well managed redevelopment projects, and Lisbon is one of them. The city has many old buildings that seem to just be waiting for the moment they will be discovered by an expert and restored to its original beauty, with the necessary modern twist, of course. 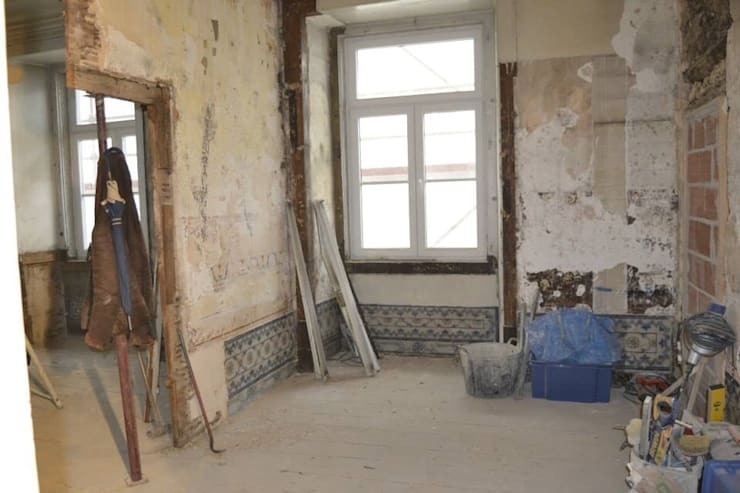 This was the condition of the house before the operation, one of degradation that seemed difficult to recover from. Some traits that recall the past, however, attracted the attention of designers. We can see this ourselves and, in fact, even in this devastated landscape seem to have a lot of potential. 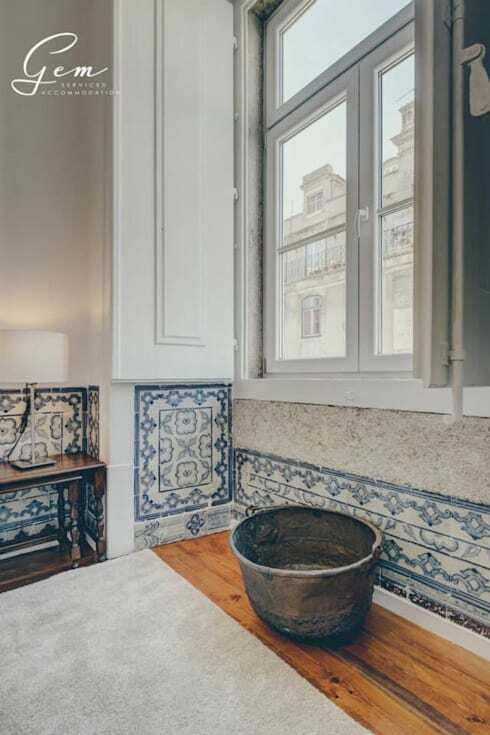 Take, for example, the beautiful tiles running along the perimeter of the room. As seen in this image it was then decided to eliminate some of the walls, a very common practice in modern renovations, which seeks more space and continue as solutions to partitions that are too limiting. 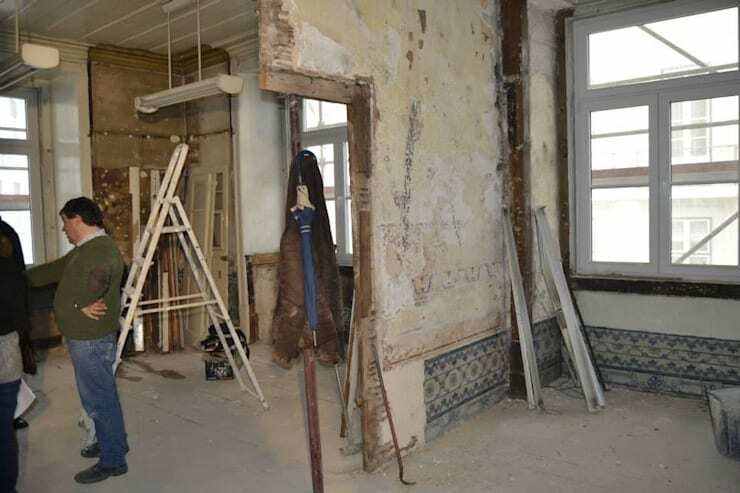 We can see the builders in the process of removing this particular division, which will open up the available living space and increase access to natural light coming into the home by means of the two large windows on either side of the wall. Remember the old tiles in previous image? Well, now they have become a decorative element that adds a touch of vintage, and is fashionable more than ever. If, however, this element had not been exploited in an efficient and elegant way, it would certainly not have had the same effect. Here the tiles have set the right tone for the decor, white and empty surrounded by blue are essential to create a large bright space. The wooden floor is another element that leads us to a past recovered while the mirror, with very modern details, gives charm to the room. In the bathroom, what draws attention is the lining of the walls with tiles so different and original in their colouration. The shower is a true inspiration, with glass all around and wood on the bottom. 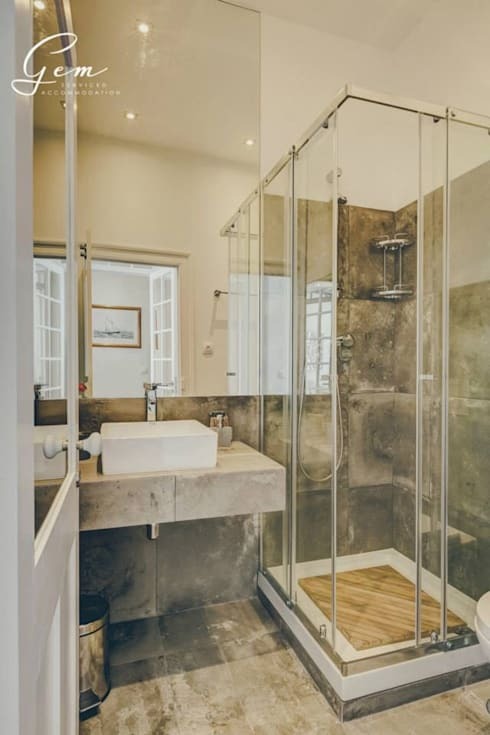 The use of the wood here emphasises the natural element brought into the room, and this resonates with the tiles, which has the effect of worn stone. 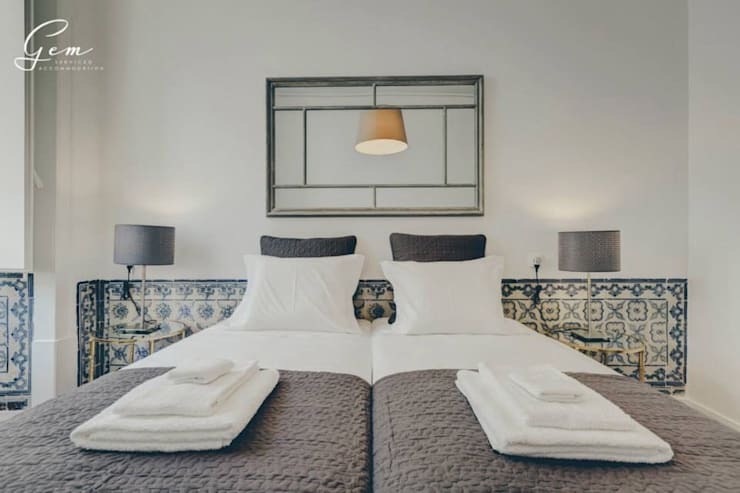 This is a nostalgic nod to the character of the apartment as an age-old building, whilst also being in line with contemporary trends in tiles and bathroom decoration. This image shows the corridor that connects the various rooms. Here we can see that the house has a very high ceiling, a nice feature that is common to many old buildings. Here too we find a wood floor, decorated with ornamental accents that bring colour and life to the space. This is very impressive, as it can be difficult to do something creative with a hallway. 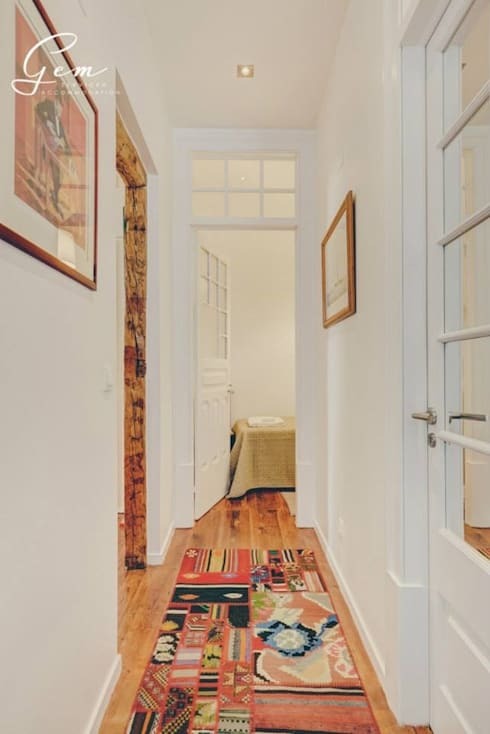 Here at homify, we've got you covered, though, so take a look at: These hallway floors that will sweep you off your feet! In this corner of the house we see some details that make a big difference, with comfort and elegance. 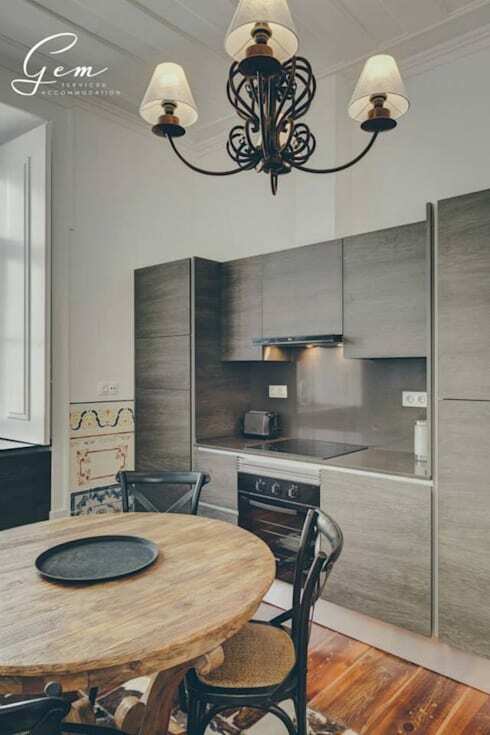 For example, the table and the lamp are very modern, while in contrast, the bucket that you see in the picture, with a rough finish, transmits an atmosphere along with the country-style tiles to the space. The kitchen keeps this dialogue between the rustic and the modern going which we have seen in the previous spaces as well. The solution to the wall also allowed to leave space for the dining area, organized in a simple but functional manner. Other rustic elements that make this a very elegant space are the bench and wooden furniture that we see in the image. The wooden bench is of particular interest, as it consists of a design of curved and ornamentally formed wood, which gives the seating area a sophisticated, vintage look. If you are looking for such fine, handcrafted pieces yourself, take a look at our wide range of: Professionals who offer an extensive range of furniture and accessories for each taste. The living room also has decorative elements that give the place elegance, in a harmonious whole. Examples of this are the sofa, the mirror, the carpet, for a result that would be really hard to forget! 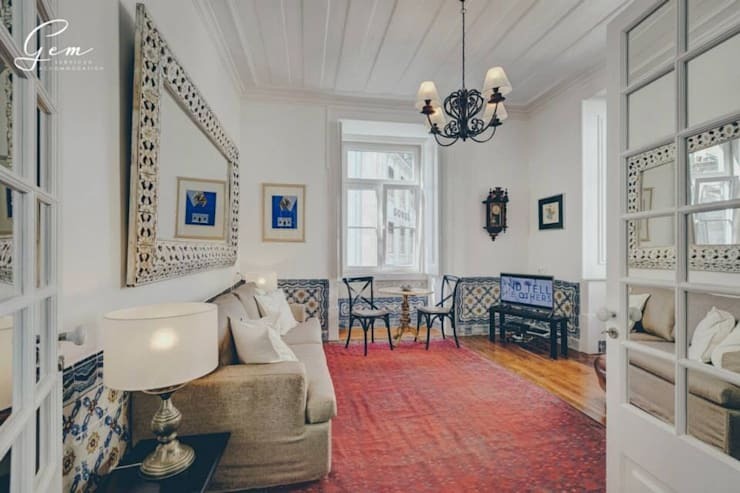 Colour is used so wisely here, with mostly white accentuated by cool colours in the tiles and furniture, and then just subtly complemented by the warm, rich red of the carpet. What did you think about the new colourful, eclectic decoration style?